David Powers King: Post: Vacation, Or Survival Practice? Post: Vacation, Or Survival Practice? Vacations are nice. I sure wish I appreciated them more what I was young. Hopefully the little ones will. For us, we enjoy the road. Sure, we could fly over everyone, or slowly chug along on the train, but there's something almost magical about the open highway, with its brief glimpses and interacting with folk who have different worldviews at each stop. This is discovery fodder. This trip, we're taking it to another level: survival practice! Camping along the way, living off canned and packed goods, stuff like that. Why? If you noticed, I added a WIP: Unannounced Zombie Novel (working on the title), and it will be 100% discovery. No planning. Minimal research. I'm bringing to it all of my useful and mostly useless knowledge while adding a twist to life experiences and my personal touch on the zombie mythos. And it's working. My CPs really enjoyed chapter 1 - even the one who hates zombies with a passion. Sweet! A few new members have come to see us off! Thanks, and welcome aboard The Cosmic Laire! Be sure to pick up a cruller before you go, okay? Update: Our Woven revision picked up steam last week. We're well over halfway now. Had to take a momentary pause for some world remodeling (a fictional world's history can be a pain sometimes ...). Our third Scrutiny Session went well. Hopefully we'll tackle another 15k before I leave. Our August deadline is still a go! Got vacation plans this summer? Does it include zombie survival training? How many crullers should I pack? I'm David, and this looks like fun! My wife and I are taking off on vacation this weekend. Sorry, as much as I like to drive my sports car, I hate road trips. I need my own highway. Or cannons on the front of my car. Oooo... your new WIP sounds great... Way to tap into the undead part of your brain... ;) Can I take two crullers? There's this guy who dresses up as a zombie and runs around scaring people. It's all over YouTube and it's HILARIOUS! Not that that has anything to do with anything, but thought I'd mention it, lol. Have fun on your discovery vacation! I hope you survive. And bring LOTS of crullers. 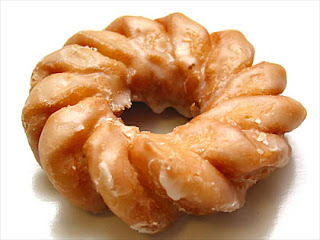 Crullers are like elfish bread, a little bit goes a long way - particularly with the 4-foot and under crowd. Zombies? Wow! I just read another blog about participating in a zombie run. Sounded like fun. I hope your camping vacation is zombie free though. I have a family reunion vacation in a week in the mountains and I'm really hoping to get away from everyone occasionally and enjoy the serene nature and write. The only zombies I've really enjoyed to far are those created by Carrie Ryan and those trying to eat plants. Have fun with all that research. I'm sure it will add some authenticity to your book. And congrats on the Woven progress that you've made. Seriously? A zombie survival vacation? That's awesome! Your wife is a really good sport. Have fun on your trip!! And if you happen to run into zombies, that's just perfect for research and inspiration! Bring a crossbow, though. Have a great survival vacation! I like camping, but don't think we will this summer. Too many wildfires, and then the risk of starting one would hang heavy on my head. They might have put fire bans on camp sites, anyway... I hope you have a great time, though. And running into zombies would be gross. OOOH! New book sounds fab Dave, and I'm excited about how you're doing it! That is definitely the way to go with this! I know it's going to be awesome! Congratulations on your writing progress. "This is discovery fodder." I never thought of it like that before. Must explain why I like road trips.